The Paradox Sports Team continues to shift and grow, and we are excited to introduce the following people helping us provide world-class adaptive climbing experience across the country. We couldn’t do it without the unique contributions from each of these individuals! 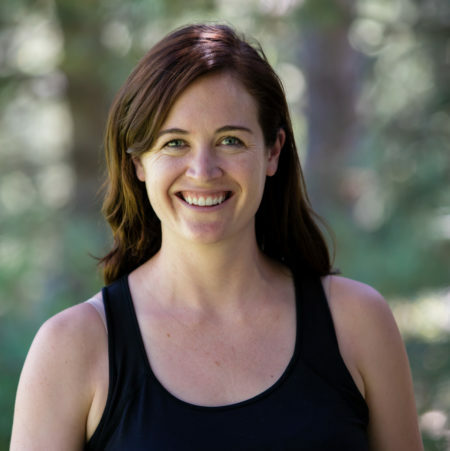 Born and raised in San Jose, CA, Becky moved to Colorado in 2004 to attend University of Colorado – Boulder. While in college, she met her future husband and upon graduation moved to Philadelphia where she worked as a preschool teacher and then a house manager for six years. The pull of Boulder proved to be too strong and in 2016, she moved back and got involved with Paradox Sports playing a key role in the first annual Base Camp Breakfast in 2016. Together with her husband, Becky has a daughter, Rose, a golden retriever, Charlie, and two cats, Eliko and Rasputin. In her spare time she enjoys running, listening to true crime podcasts, and photography. Rex Laceby is a retired, prior-enlisted, Marine Corps Officer. He served in the Infantry, became a Force Recon Detachment Commander and eventual served as an Infantry Company Commander. As a combat veteran with disabilities that completed numerous worldwide deployments, Rex understands how Paradox Sports Veteran Programs can help our nation’s veterans deal with PTSD and help them find a new Task, Purpose and Sense of Community. Rex currently works at the University of Colorado Boulder, where he helps veterans in transition / career development. Rex founded and serves as President of the CU Boulder Veterans Alumni Association and is engaged in other statewide veteran organizations. Still giving back to his community, Rex is a technical rescue volunteer with Boulder Emergency Squad (BES). He is proud to serve Boulder County as a Public Safety Diver, Swift Water Rescue Technician, Wildland firefighter, Ice Rescue Trainer and in any emergency BES assistance is needed. After graduating from high school in the summer of 2004, Shawn Sturges was experiencing a puzzling sudden decline in vision. Before summer’s end his world turned black – literally black – caused by Leber’s Hereditary Optic Neuropathy. Shawn was now classified as “VI” or a visually impaired individual. It took time to adjust to his new life, and he eventually returned to martial arts and school – earning multiple Bachelor’s degrees in Business Administration. Through Martial Arts and University, he learned the discipline, perseverance, determination, and belief in one’s own abilities that are needed to find success which he later took to rock climbing. 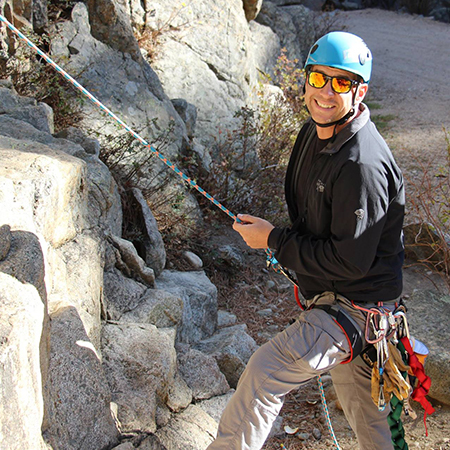 In the fall of 2015 Shawn was introduced to rock climbing by a friend, and he was hooked. Shawn joined the local Adaptive Climbing Group (ACG) to learn climbing techniques at Brooklyn Boulders in Chicago. A year later he joined an adaptive climbing competition team to compete at the USA Climbing Adaptive Nationals in Georgia in the summer of 2016, taking home second place in the visually impaired category, and earning him a spot on team USA to compete in the 2016 IFSC World Para Climbing Championships which were held in Paris, France 2016. In the Spring of 2017, he joined the Paradox Sports Adaptive Climbing Skills Clinic in Joshua Tree National Park where he learned crack climbing techniques, aid and trad climbing techniques, repelling, anchor building, and many other climbing techniques to be both a safe and more responsible outside climber. Shawn also joined the 2017 Paradox Rocky Mountain National Park trip to climb Long’s Peak, one of the 14,000ft. peaks. Inclement weather altered trip plans, however this resulted in Shawn’s first successful multi-pitch and rappel of “The Bomb” on The Wind Tower in Eldorado Canyon. Shawn has climbed multi-pitch routes on Devils Tower and in Vedauwoo, bouldered in the world-renowned Fountaine Bleu in France, ice climbed in the upper peninsula of Michigan, and again joined Paradox in 2018 at The Red River Gorge. He continues to hone his skills to reach his future goals to climb big walls, multi-pitch climbs, and ice both in the U.S. and around the world. Texas born and Virginia raised, Bayley had not even seen a mountain until about age 8 when she learned how to ski in Sun Valley, Idaho. Ever since, she has been visiting the Rockies on annual family skiing trips. After graduating from the School of the Arts at Virginia Commonwealth University in 2012, she began a career with Nordstrom taking her from VA to DC and Baltimore. But she couldn’t deny her love for the mountains, and in 2017 Bayley stepped down from her management role, sold her belongings, and moved to Colorado permanently to pursue a career in Marketing. 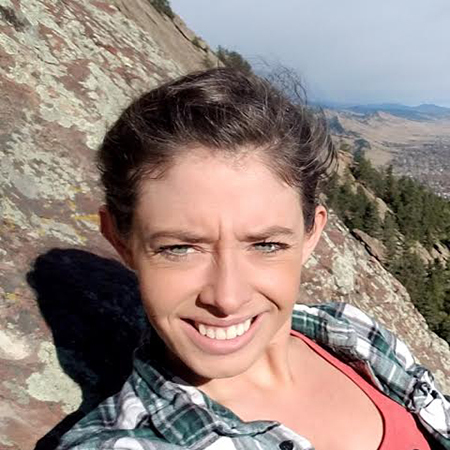 As a self-starter, Bayley has taught herself coding and volunteered as a Visual Designer for Code for America to redesign a resource app for Boulder’s homeless. Her background in the arts, customer service, and management has led Bayley to a well-rounded grasp of marketing – everything from visual design to clear communication. 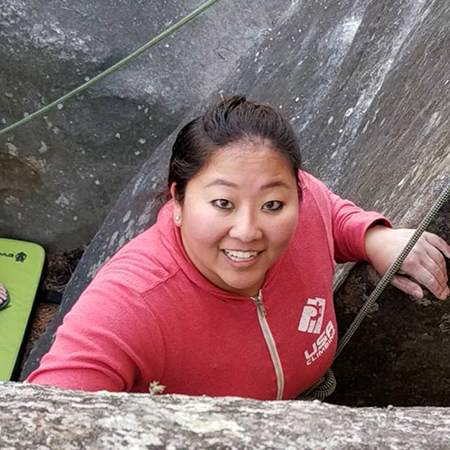 Bayley is passionate about, although new to, rock climbing, and saw working with Paradox as the perfect opportunity to grow professionally and give back. In her free time you will find Bayley playing Sudoku, drawing, dog walking and or finding another adventure outdoors! Since moving to Colorado last year, she has fallen in love with the Boulder Flatirons. Bayley has free-soloed the second and third flatirons, and has goals to free-solo the 1st, 2nd & 3rd Flatirons in one day. When Jessica was only four months old, she was dropped of at an orphanage in South Korea due to a tumor in her leg, leading its amputation. Sporte had a new beginning when she was adopted by a family in Michigan. Growing up with 8 siblings taught Jessica that, although one could make up many excuses for not doing something, having one leg was not a good enough excuse to get out of chores. And if she could do chores, she could also play sports. Jessica traveled the U.S. competing in wheelchair tennis, earning a career high of 2nd in the nation and 59th in the world. She also participated in wheelchair basketball, sled hockey, and downhill skiing. In 2012, long ski runs enticed her to move to Colorado. However, it wasn’t until 2015 that she participated in an Adaptive Climbing Club night and was introduced to Paradox Sports. Since that night, Jessica has missed few club nights and instead competed at three paraclimbing Nationals and a World Championship, and is a Paradox Sports Ambassador. Jess has a degree in Recreational Management and began working with Paradox Sports in the summer of 2018 as a Program Lead. Besides sports, Jessica also enjoys reading, DIY projects and crafts such as knitting, card making, and origami. Dom is originally from central Connecticut where he was introduced to climbing, and working with Youth. Getting started at an outdoor challenge course in 2009, Dom has been in the climbing industry for almost 10 years – working in route setting, coaching, gym management, and everything in between. Climbing has taken him all over the country, and the world. In 2015 Dom took a training course with Paradox and he has been working with adaptive programs since. 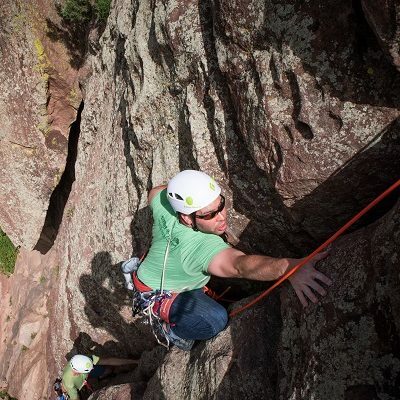 After moving to Colorado in 2017 to help facilitate the opening of a successful rock climbing gym, Dom was looking for a way to make more meaningful connections in the community. He joined the Paradox team as part-time Climbing Club Coordinator in Spring 2018 and is excited to be able to share his passion for climbing with more fellow climbers than ever! Dom works full-time as the General Manager at Ubergrippen Climbing Gym in Denver. When he is not able to get on rock, Dom enjoys snowboarding, slack-lining, and exploring craft brewery’s.